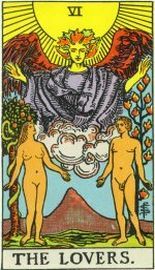 The Major Arcana Cards are typically described as the Journey of Life undertaken by the zero card – The Fool. 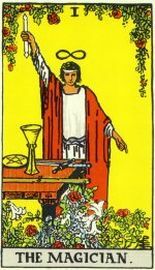 I : The Magician – More a stage magician than anyone possessed of real power, The Magician card symbolises action, objective practicality, consciousness, energy, creativity and precision. It typically represents the potential or resources of the querant. 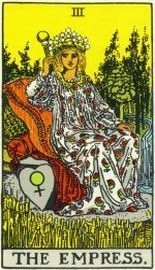 II : The High Priestess – Typically associated with wisdom, knowledge, common sense and knowing, particularly in reference to some secret knowledge you may be keeping to yourself. 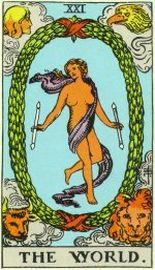 III : The Empress – Symbolises maternal fertility, mothering, physical attraction, comfort and desire. Typically it refers to dominance over life, usually in an emotional context. 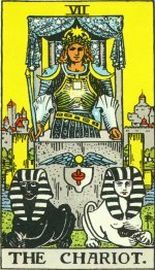 IV : The Emperor – Fathering, stability, dominance, power and the status-quo. 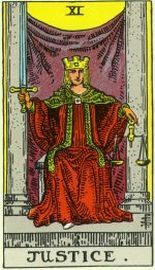 When applied to the querant, this card generally implies the desire to rule over one’s surroundings. V : The Heirophant (or Pope) – Represents education, stability and knowledge, but also social convention and conservatism. Generally interpreted as traditional education or a man of high social standing. VI : The Lovers – Represents love, relationships, desire, pleasures and choices. It generally indicates an impending decision about a current relationship, rather than a new relationship. 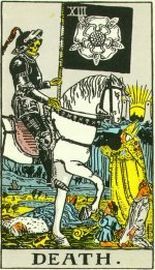 VII : The Chariot – Represents conquest, honour, willpower, inflexibility and impulsivity. It is generally interpreted as a battle that can be won if the querant has sufficient willpower. VIII : Strength – Typically represents self-control, stability, inner strength or serenity. It usually symbolises a requirement for inner focus, and for reconciling the impulsive with the rational. 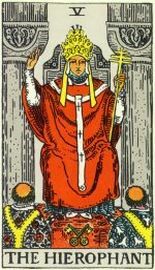 IX : The Hermit – Represents solitude and deep philosophical understanding. 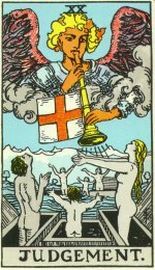 This card can either be interpreted as the need to withdraw from society to seek answers, or the need to return from isolation and reintegrate with the world. XI : Justice – Generally represents impartiality, rationalism, responsibility or clear vision. 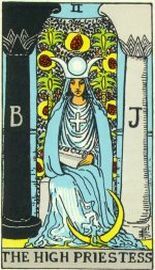 Unlike the High Priestess, this card generally implies knowledge or a decision that exists in the public domain. 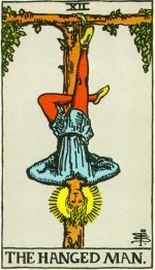 XII : The Hanged Man – Usually represents conformism, acceptance or sacrifice (often in a divine context). This card generally points to divinity, with specific reference to Christ’s Passion (suffering). XIII : Death – Usually represents the end of a cycle, being caught in a transition, or a farewell. It typically implies an end, although usually this applies to a relationship or situation. 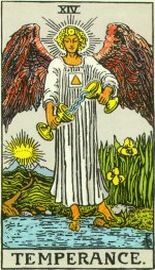 XIV : Temperance – Represents moderation, humility and balance. 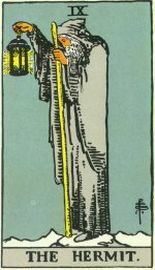 This card generally implies a need for patience or temperance, though the exact position of the card in the spread will determine what this will apply to. XV : The Devil – Represents lust, hedonism, temptation, physical attraction, pessimism and doubt. It usually implies that the querant is holding on to an idea or ideology that limits self-growth. 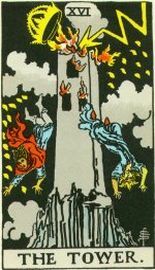 XVI : The Tower (or Donjon) – Represents chaos, sudden change, disillusionment, a downfall or ruin. 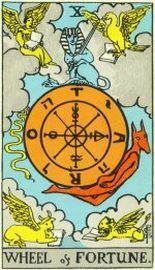 This card may imply that the querant is holding onto a false illusion, but it is also linked to the transition while meditating from an alpha state (mind-centred) to a theta state (mind-stage centred). 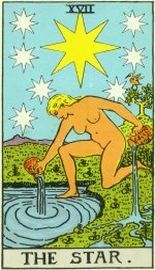 XVII : The Star – Represents calm, hope, tranquillity and optimism. This card generally implies renewed hope or optimism. XVIII : The Moon – Often represents lack of clarity, illusion or deception. It usually implies a need to calm the animal nature of the mind, but it can also symbolise nightmares. 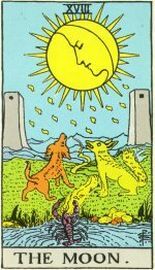 XIX : The Sun – Represents optimism, splendour, happiness and positive energy. 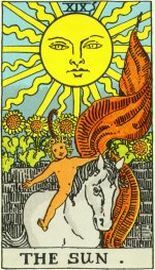 It usually reflects happiness or a positive outcome, and is considered one of the most well-favoured cards in the Tarot deck. 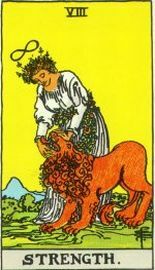 XXI : The World – Often represents fulfilment, prosperity, completion, wholeness or contentment. 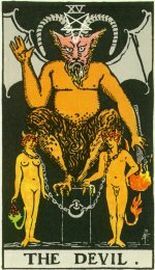 This card represents the ending of the cycle of life, or the pause before the next great cycle of life which begins with The Fool (in the Rider-Waite deck). 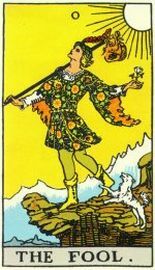 0: The Fool – In the Rider-Waite Deck the Trump Cards represent the journey of life undertaken by The Fool. 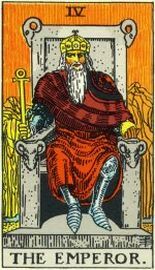 It typically represents being unencumbered, but one common interpretation of The Fool appearing in a spread of trump cards is that it is an instruction to strip down the interpretation of the neighbouring cards to bare essentials, and attempt to shed all obfuscating emotions or thoughts about the divination attempt.